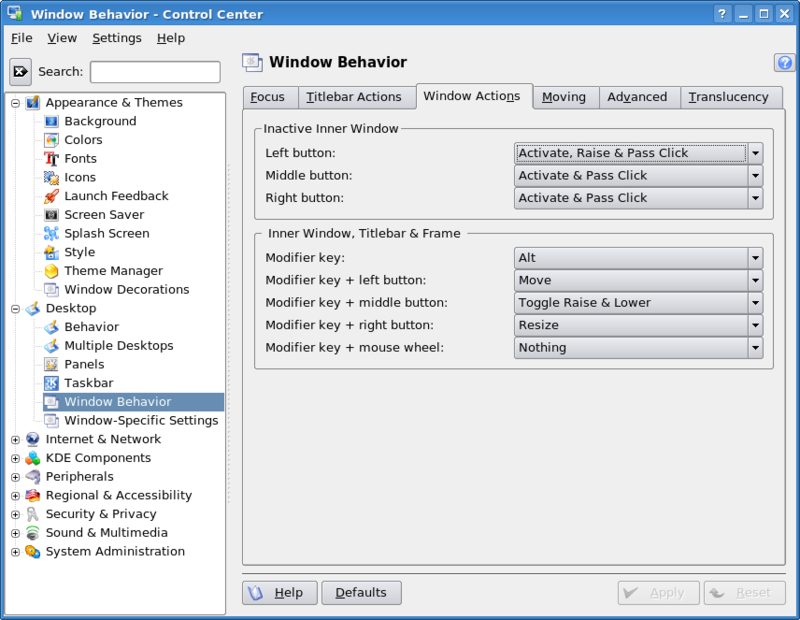 Window behavior defines how program windows act when you interact with them using the mouse and keyboard in various ways. You can specify how windows are to act when the Title Bar is double clicked, or what happens when you left click on the main portion of the window. For the most part these configuration items do not need to be changed but you may find that you like the way your desktop works if you make some changes here. You should feel free to experiment with these settings if you want to make your mouse interact a bit differently with windows than the defaults. It is always easy to return to the default actions for a given tab just by pressing the Defaults button at the bottom of the page. I will describe the basic functions of each of the tabs in this section of the Control Center without going into significant detail at this time. The Focus tab allows you to determine how the mouse works to set the window focus. The term focus is used to describe the window that currently accepts input such as keyboard data. A window must have the focus in order to accept keyboard input and only one window can have the focus at any given time. The window with the focus is said to be in the foreground and all other windows are in the background. Choose how window focus works. Focus is usually given to a window when you point to it with the mouse can click on it. However you can also configure the this behavior to give focus to a window whenever the mouse points to it even if the mouse pointer is not clicked. This can be interesting and even useful behavior, but it can also be disconcerting if the mouse pointer is inadvertently moved over a different window while you are typing and that window gets the focus so the last part of wht you type is entered in the wrong window. You can probably tell that I tried this for a while — a long time ago — and found it annoying and not conducive to productivity. The other options on this tab allow you to define how long it takes for focus to be given to a window when the mouse pointer rolls over it. The Navigation section of this tab defines the behavior of the desktop when switching between windows using the keyboard instead of the mouse, particularly if you have windows on multiple desktops. By default the behavior is to only switch between windows on the current desktop. You can change this so that windows on all desktops are activated as you navigate them using the keyboard. This tab allows you to configure mouse actions on the Title Bar. You can specify which mouse actions perform specific actions when they are applied to the Title Bar. Among other things you can specify which mouse action causes the window to shade/unshade, open the operations menu, what actions are performed by the mouse wheel and so on. 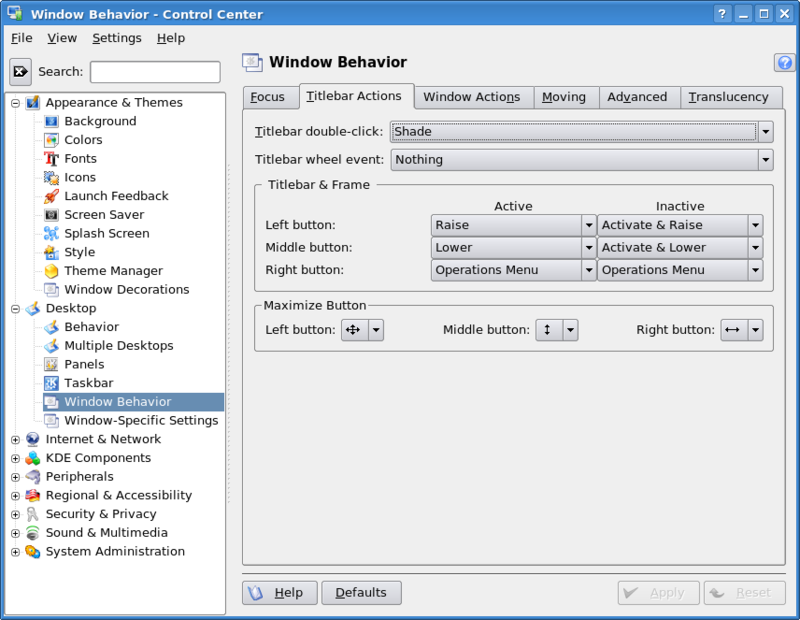 Window Actions define mouse actions when it is used in the main window or on the window frame. 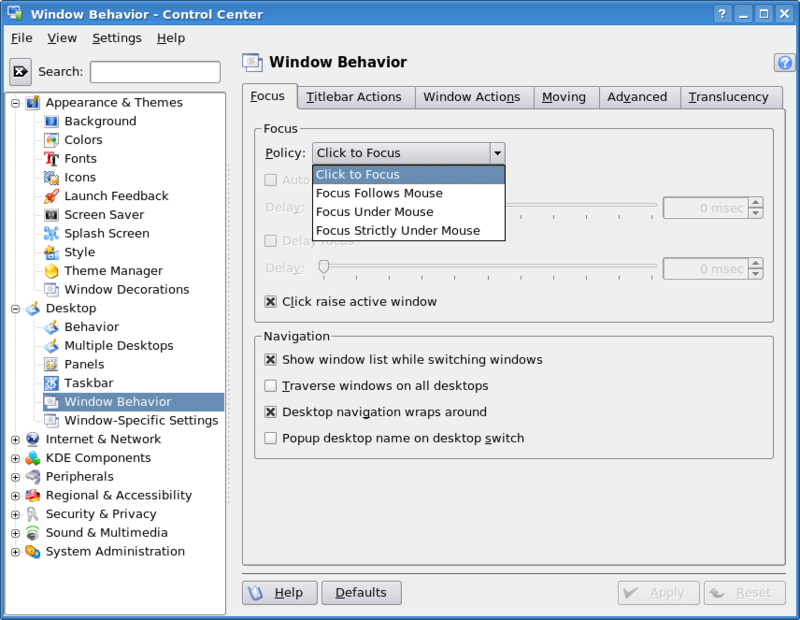 The Window Actions tab allows you to define the results of various mouse actions when they are performed in the main window or on the window frame. This tab defines how windows act while you are moving them around the desktop. The only option I usually change here is the second one from the top. I like to see the contents of the windows while I am resizing them. The default is not to show the contents because it takes fewer CPU cycles. If you are using an older computer with a slow CPU you should not change this option and you may also want to uncheck the first option, to diplay the contents of windows while you are moving them which also takes a lot of CPU cycles. 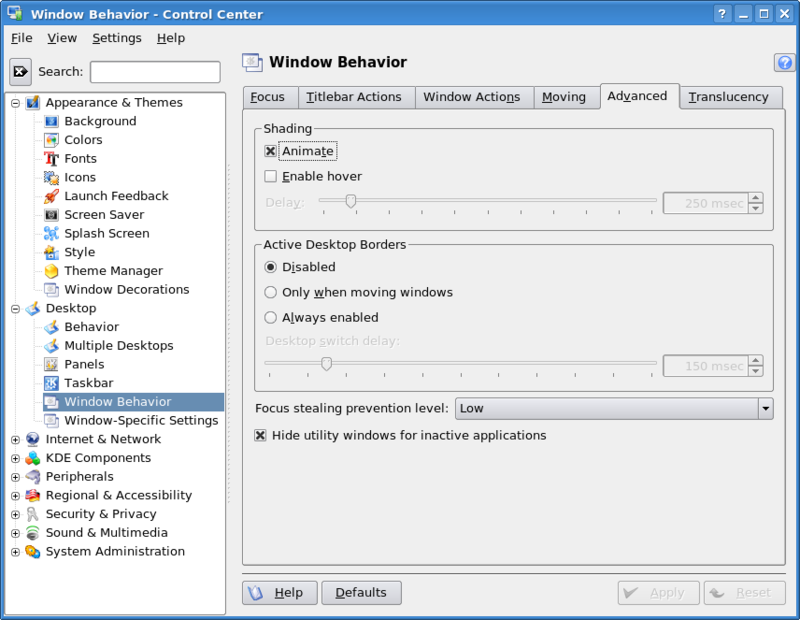 The advanced tab allows you to specify whether window shading is enabled. It also allows you to specify that a window can be moved from one desktop to another using the mouse if you are using multiple desktops. If this option is enabled, a window can be drug from one desktop to another instead of having to use the Title Bar icon menu. The Tranclucency tab allows you to configure windows to be translucent, that is to be able to see through them to some extent. In Fedora 8 and previous versions, this is experimental and can cause desktop crashes so I strongly recommend against turning on translucency. This page is no longer available in Fedora 10 due to the addition of advanced desktop effects. Computers are easy; People are hard.